On Tuesday, April 17, the Johnson City community was graced with a performance by the famous Parker Quartet at the Munsey Memorial United Methodist Church. 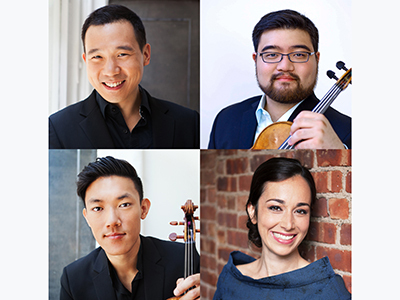 Hosted by ETSU’s Mary B. Martin School of the Arts, the string quartet, known for their expressive and colorful interpretations of classical works of art, currently consists of violinists Daniel Chong and Ken Hamao, violist Jessica Bodner and cellist Kee-Hyun Kim. Johnson City is only one stop on the Grammy-award winning group’s tour this year. They have already performed in numerous states, including California, Minnesota, Michigan, New York and Massachusetts and set to perform in Oklahoma, North Carolina and Canada. The group’s performance included renditions of pieces from historic composers such as Mozart, César Franck and György Ligeti and also featured a guest performance by pianist and ETSU faculty member Esther Park. The Parker Quartet has become known for performing at unconventional venues as well as collaborating with artists who fall outside of the conventional definition of classical music. They use these experiences to add to their perspective of the masterpieces they perform. “I think that the perspective of where are now in history and what is going on in the modern world gives us a sort of inspiration and freshness that we really try to portray and bring to this music,” said Chong. The quartet’s performance was truly breathtaking. Each member carried a distinct sound and style that complemented the others perfectly, and the acoustics of the venue, from the high ceilings that allowed the high notes to linger like musical chandeliers to stone walls that provided a warm resonance, offered an enhancement of the performance that would very likely be unmatched at another location. For more information for upcoming events hosted by Mary B. Martin School of the Arts or to join their mailing list, visit etsu.edu/martin or contact them at 423-439-8587 or artsinfo@etsu.edu.